There are three representations of the Buddha-- body, speech, and mind. Actual statues are representations of Buddha's holy body. The scriptures represent Buddha's holy speech. 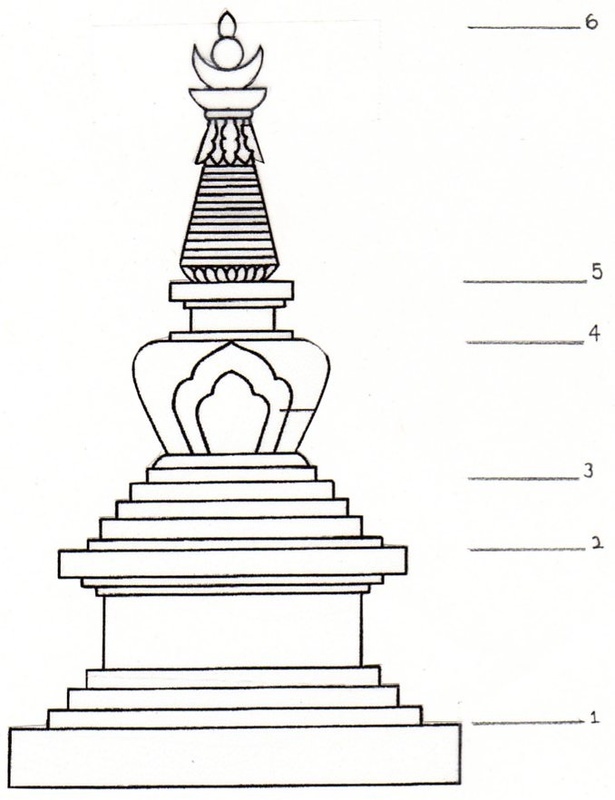 And stupas are the representation of the Buddha's holy mind. Stupas are also called "the embodiment of wisdom". Stupas reveal the path to enlightenment, how an ordinary mind can be transformed into an enlightened mind. The stupa shows all three. The base (1) and the throne (2) of the stupa are the ethical foundation of all Buddhist practice. The steps (3), vase (4), and harmika (5) are the path, the actual practices. Then the pinnacle (6) represents the result of the practices, the enlightened mind.